Welcome to the Boars of Texas website, your one-stop swap shop for your hog hunting needs. Regardless of what state you call home, take advantage of our free classified section for buying or selling your hog dogs and hog hunting supplies, and check out our competition page for upcoming hunting competitions taking place in your area. 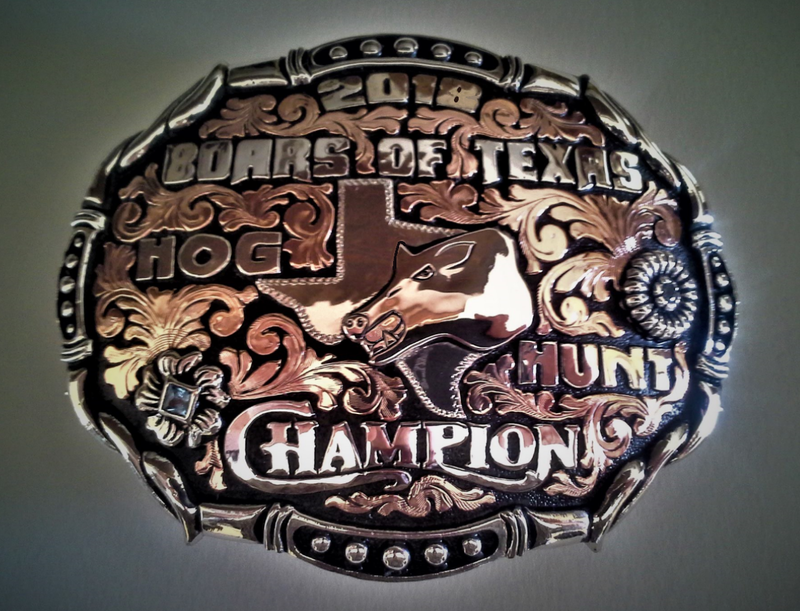 The 2018 Boars of Texas Hog Hunting Competition concluded February 4, and the team standings have been posted. All of the weights recorded were based on the live weight of the animal. Stringer weight for the main competition contained up to the five heaviest hogs. The minimum weight of each feral hog weighed had to reach 100 pounds to count for any portion of this year's contest. Congratulations to Bonds Ranch (Clint Hegefeld, Richard Elfrez, Rex Bumpus, Jeff Hughes) from the Rosebud area, who won first place in the competition with a 1426 pound total for their top five heaviest hogs, shattering the old record for first place set back in 2015 by 100 pounds. They took the ‘Largest Sow’ category with a monstrous, record-setting 331 pound hog, and also won the Wild Card Drawing. Bonds Ranch left with a well-earned total of $8,000 in prize money, a full set of Wild Boar USA cut gear, and some brand new 2018 Boars of Texas Hog Hunt buckles. Second place went to Hat Brand (Dustin Millican, Mason Gaston, Colten Sullivan, Danny Butts) from the Splendora area, whose top five hogs totaled 1377 pounds earning them $4,000, plus an additional $2500 for the ‘Largest Boar’ weighing in at an impressive 305 pounds, breaking yet another Boars of Texas record. Third place, with only a ten pound difference separating them, went to Bar C (Patrick Matejka, Jimmy Evans, Jake Conrad, Randy White) from the Bryan area, whose top five hogs totaled 1367 pounds. Goldsmith Ranch (Chase Goldsmith, Scott Mackey, Eric Patterson, Hunter Patterson) from the Baird area, took the 'Longest Stringer' with 36 head of qualifying hogs weighed in, and left with a total of $2,500 in prize money. There were a number of other great prizes awarded to the contestants through our Free Hunter Raffle too. We had additional items donated through Citizens State Bank of Somerville, TX; Double U Hunting Supply of Yacolt, WA; and Gun Dog Supply of Starkville, MS. On top of that, all contestants who checked in at the hunt also received a complimentary Boars of Texas Hog Hunt cap, or t-shirt of their choosing. This turned out to be a great hunt, and I appreciate everyone who helps support this tournament each and every year. Thanks to all of the volunteers who come out and help at the weigh-in. You folks are invaluable to the hunt, and I really appreciate all of the hard work. Thanks to all of the prize donors, sponsors, hunters, and recipient organizations for making this year another success. Sponsors & Donors include: Burleson County Chamber of Commerce, Burleson County Fair Association, Wild Boar USA, WW Paul Scales, Double U Hunting Supply, Citizens State Bank of Somerville, InkDots of Houston, Burleson County Detail, & Homeyer Feed & Supply). Visit our Sponsor Page for more information. Pictures of past events can be found on the Boars of Texas Facebook Page. If you’d like to see your right to use working dogs protected, please join the Texas Working Dog Alliance. It is currently free to join, and they’d be happy to have you. (TWDA Member Application). Contents copyright © 2011-2014 Matthew Renner. Source code copyright © 2011-2014, Marc W. McCord dba CobraGraphics. All rights reserved. Boars of Texas is the exclusive tradename of Matthew Renner. CobraGraphics is the exclusive tradename of Marc W. McCord dba CobraGraphics. The textual, graphic, audio, and audio/visual material in this site is protected by United States copyright law and international treaties. You may not copy, distribute, or use these materials except for your personal, non-commercial use. Any trademarks are the property of their respective owners. All original photographs on this web site are the exclusive property of Matthew Renner or other designated photographers, and may not be copied, duplicated, reproduced, distributed or used in any manner without prior written permission under penalty of US and International laws and treaties. This web site was created by Marc W. McCord in native html using Microsoft Notepad text editor. Graphics and custom text graphics were created using Adobe Photo Shop v6.0, Paint Shop Pro v6.0 and Paint Shop Pro v9.0 graphics programs.